It gives me the great pleasure to announce the winner of the Tigress Julie Photo Competition for 2013. It is Marion Volborn. Congratulation Marion. I look forward to welcoming you and your husband on a Big Cat Safari. Marion's outstanding picture of the steam coming out of the Tigers mouth, illustrates the advantage of visiting Tiger Canyons in the mid winter (June, July). Shot against the rising sun the backlight beautifully illuminates the steam. Marion's picture captures this perfectly. 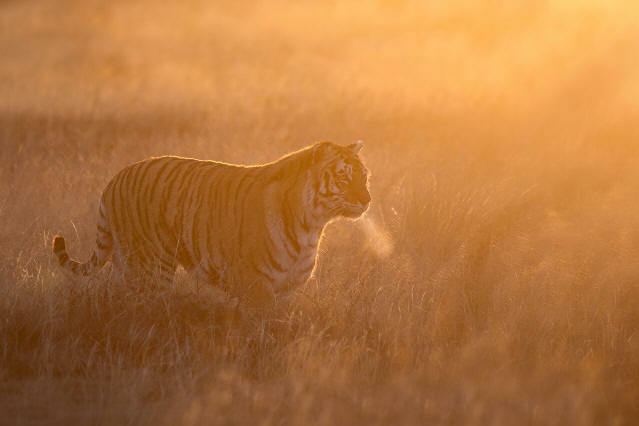 My desire was to take a photo of a tiger in the morning with breathing against the light. Only on the last day so I managed a photo and I was overjoyed. Few who witnessed the brutal fight between Shy Boy and Sunderban (as told in Newsletter No 74) will forget the primeval scene as these two huge male tigers, steam rising from their mouths a bodies, fought for territory in the Tiger River. Marion's picture captured a less brutal fight between Tigress Shadow and her daughter Panna. 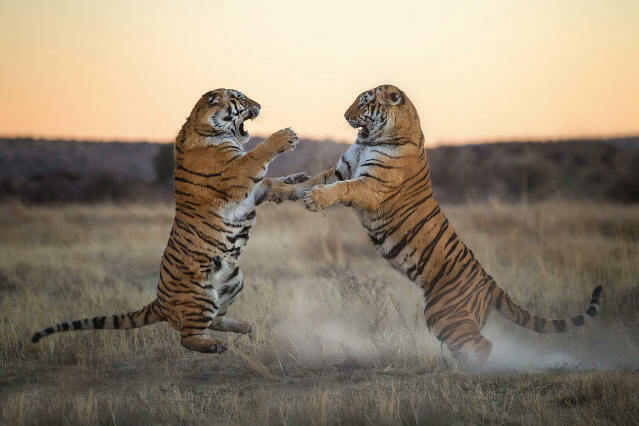 Both tigers rear up, protecting their throat and spine, throwing the paws forward, claws extended, with blinding speed. Shadow walked slowly toward Panna. There was a small dispute. Shadow showed Panna that she is the dominant female cat. 70-200 f2.8 GII VR lens. Lions will instinctively kill any prey-competing predator they happen upon, especially predators that could present a danger to their young - like leopards. The distressed leopard finally decided to take his chances. 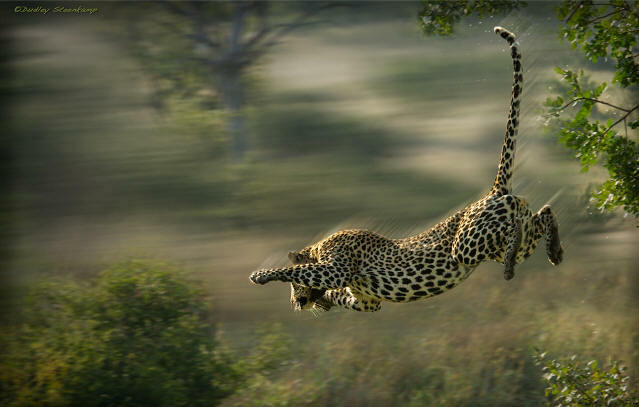 A leap followed by a dash for freedom would mean potential injury for him on ground impact, that misfortune would spell certain and instant death in the jaws of the lioness - the stakes were high, the pregnant lioness was not going to simply walk away, the leopard knew that too. His moment finally came when the lioness appeared to be looking away. In a dash of speed he leapt from the tree, hitting the ground with a bone crunching thud. I was fortunate to get this airborne shot as he flew through the air. 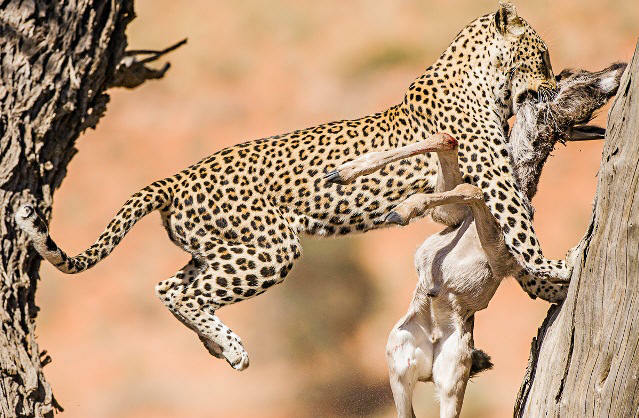 Kemlyn Perry's picture of the Tiger jumping onto a rock and Bridgena Barnard's picture of the leopard hoisting its prey both show the athletism of the tiger and the leopard. In addition both pictures capture the part the long tail plays as it counter balances the cats. 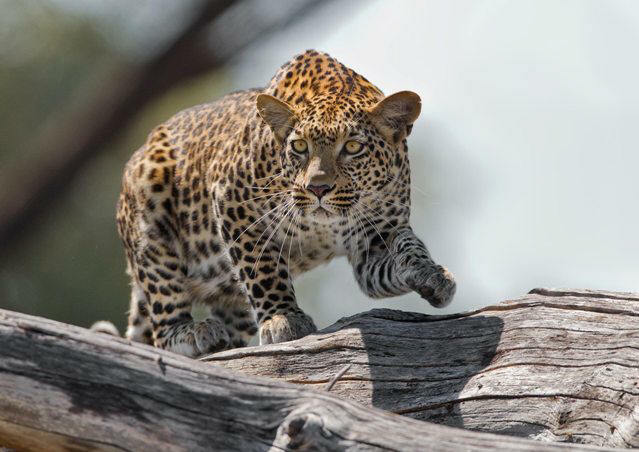 Alex Kirichko's picture of the leopard stalking over the log is exceptional. The haunting eyes and the intense concentration typify a leopard closing on its kill. Tigers will often mate 150 times over a period of 4 days. The copulation can be painful for the female so she turns and swats the male ordering him to dismount. Nalin Trivedi's picture has captured this perfectly in this mating sequence. I would like to thank Marsel van Oosten and Daniella Sibbing for judging this year competition. Please begin preparing for next year Tigress Julie Photographic Competition which is one picture of a lion, a leopard, a cheetah and a tiger. The same format will apply. Each shot scores points out of 10. The points are added up and the person with the highest points is the overall winner. 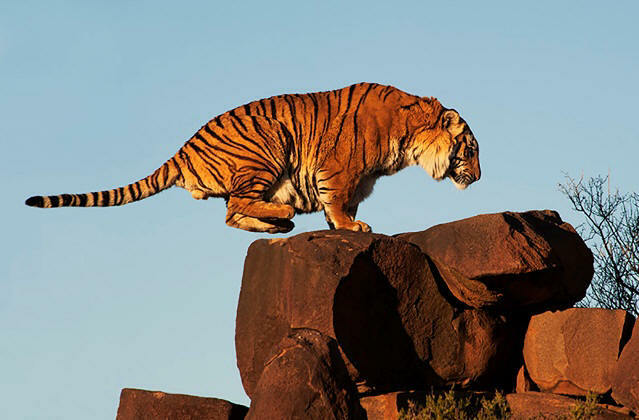 The judges for the Tigress Julie Photo Competition 2014 are Jos & Yvette van Bommel. The closing date is 15 November 2014. The prize is 3 nights at Londolozi and 3 nights at Tiger Canyons for 2 people. Good luck to all of you. In remembering the beautiful tigress Julie who died on the same day as Nelson Mandela (see Newsletter No 86) I have renamed the Savannah Fund , the Tigress Julie Foundation. In addition I have called the photographic competition, The Tigress Julie Photographic Competition. In a moving ceremony, several close friends of Julie have planted trees on her grave. This year's Big Cat Cub Safaris have started well. Ussuri has 3 cubs (ten weeks old). Ussuri has already used 6 different den sites. The dens are truly spectacular rocky outcrops. We have been fortunate to access all the den sites and the cubs 2 males and a female have become very habituated. Many outstanding pictures have been captured. Bring your long lenses for best results. I am proud to announce that the cheetah area (about 1000 hectares) is ready and shortly Sabi and Runde (2 males), Shashe and Mara (2 females) will be released into the area. The photographic potential is spectacular as we help these 4 cheetah to become fully fledged wild cheetah. I would like to thank Rodney and Lorna Drew for creating this fine area and Kevin and Basil Drew for constructing an excellent fence. Wishing you all a successful big cat 2014 with many beautiful pictures.